A sufficient graphic card - most Aero capable cards will do, except for some onboard cards. 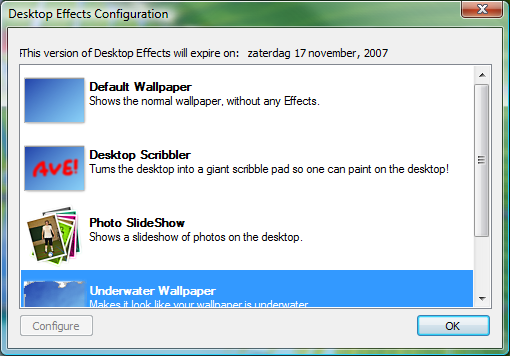 Once installed, you will find Desktop Effects integrated with Windows Explorer. 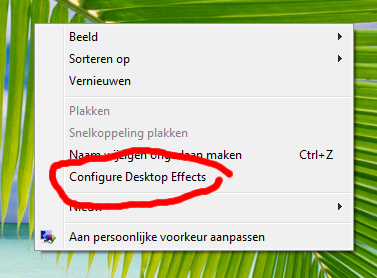 Right-click on an empty space of your desktop and choose the `Configure Desktop Effects' item. Select `Default Wallpaper' for no effect. The individual effects can configured by double-clicking on them or by selecting them and then clicking on the `Configure' button.